This hose is for suction or discharge of wet or dry abrasive materials and is suitable for handling materials for human consumption. The T714LG tube is made from natural white gum rubber 3/16" thick, which meets FDA and 3A requirements. It is reinforced with spiraled high tensile textile cords, with a flexible steel helix wire and a separate static wire. The cover material used is a green corrugated Nat/SBR blend rubber. 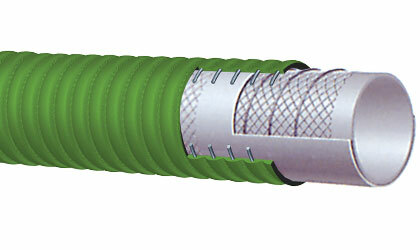 Hose is available in 5", 6" and 8" ID sizes. Click here for more info.